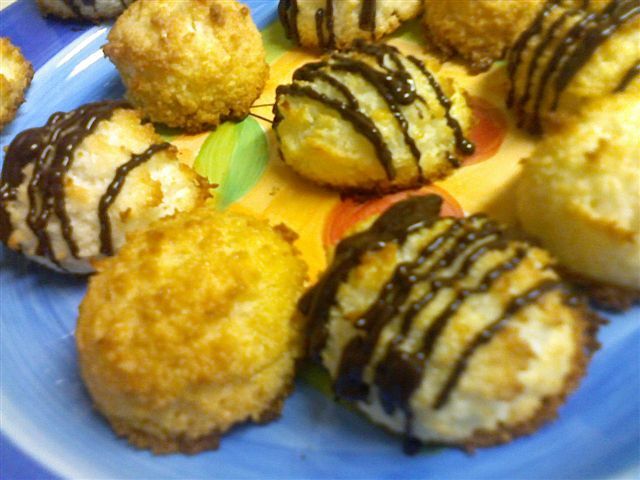 I truly love Coconut Macaroons, but of course you have to love or at least like coconut…Well I do, its funny when I was little my parents would get a huge box of “Esther Price” chocolate candy at Christmas time from my Dad’s work and I hated when I would pick a piece and it was “Coconut”!!! Of course our taste buds change and I absolutely love making these, this recipe is so simple and easy!!! So please “if you like coconut” make these, you will not be disappointed, I love having mine with a great cup of expresso…Enjoy!!! In a large mixing bowl combine coconut, butter, vanilla and 1/2 cup sugar. With an electric mixer whip egg whites until they begin to get foamy and opaque. With the mixer on add remaining sugar in a slow steady stream, keep whipping until the mixture has volumized and is pure white, but just short of holding soft peaks. Fold the whites into the coconut mixture, I use a 2 oz. scooper to make perfect mounds and place them on a baking sheet pan with a silpat. Bake for about 20 minutes, I like mine a little brown, so they are crunchy on the outside but chewy inside. I store mine just on a plate, if you keep them in a sealed container they will get soft on the outside, if this happens and you want them to have that crunch again, just heat them for about 5-10 minutes in a 350 degree oven. ***NOTE – I like my coconut a little finer, so after I measure out 3 cups, I pulse it a couple of times in the food processor. You can drizzle chocolate on them or you can add chocolate chips if you like, 3/4 cup – 1 cup.